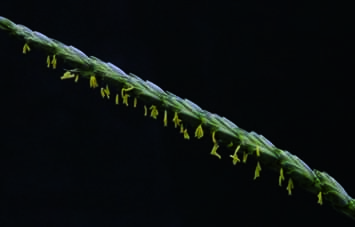 Waite researchers have identified new genetic markers linked to pollination traits in male wheat plants including anther extrusion, anther size, spikelet number and spike length. Published in Theoretical and Applied Genetics, this finding provides new knowledge about the genetic basis of wheat pollinator traits and potential target selection markers for hybrid wheat breeding programs. Lead author Dr Takashi Okada, from the School of Agriculture Food and Wine (pictured below), said that hybrid breeding has a great potential to significantly boost wheat yields. Wheat is a self-pollinating crop that produces seed when pollen from anthers fertilises the receptive ovary in the same flower of a single parent plant. Hybrid wheat, where seed is produced from two different parent plants, requires cross-pollination which is rare in nature (normally <1%). In breeding programs to produce hybrid wheat seed, it is important that the male parent be a good pollinator, ideally taller than the female parent with large spikes and extruding anthers containing abundant long-life pollen that can be easily dispersed via wind over long distances. However, a good pollinator is rare in modern wheat varieties. The research team identified the Rht-B1 locus to be linked to anther size and extrusion while markers at the Ppd-D1 locus are linked to anther size, spikelet number and spike length. These results provide selection targets for prioritising desirable pollinator traits in breeding programs enabling the development of ‘elite pollinator’ lines. “Elite pollinators would improve efficiency of cross-pollination, reducing the cost of hybrid seed production,” Dr Okada said. The same research group at Waite previously discovered a wheat gene that, when turned off, eliminates self-pollination and facilitates cross-pollination; and a mechanism in wheat flowers that pushes open the floret providing a longer opportunity for cross-pollination to occur.